It's time to just say "NO!" to the status quo! Recent events have pushed issues at Terrebonne Parish Recreation (TPR) into the forefront. The search for a new TPR Director appears to be over and many people are hoping that new leadership will bring new, modern vision. While awaiting the new appointment, Parish Administration announced new initiatives to increase safety. These changes are welcomed and much needed, even bringing TPR into compliance with state and federal laws. They are very positive steps in the right direction. However, they do not address all of the issues. 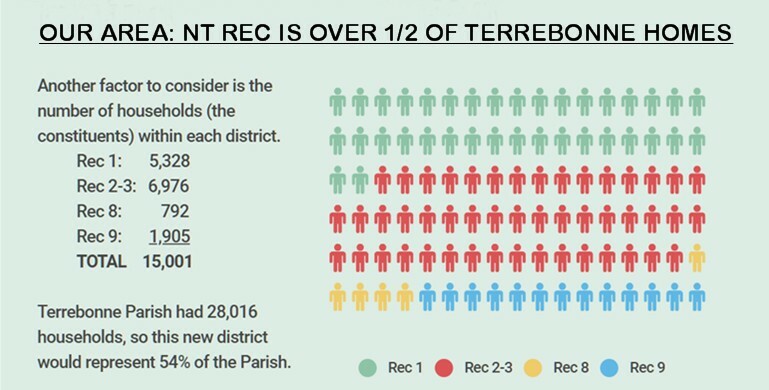 Rec Reform for Terrebonne would like to see a revised organizational structure in TPR. The new Director should be a part of creating this. We would like to see employees (either part-time or full-time) in charge of specific areas: Director of Basketball, Director of Baseball/Softball, Director of Tennis, etc. Someone accountable that reports directly to the Department Head. Current policies and procedures need to be reviewed and amended to meet the demands of modern day recreation and be applied consistently. Additional program offerings need to be explored, not just for youth sports, but also for all age groups and levels of competition. A new TPR should also modernize its communications and transparency. TPR's website should include online registration, a calendar of events, complete program description, rules and regulations, facility maps, staff profiles, safety initiatives, weather alerts, social media platforms, etc. Thankfully, Administration has been listening and some changes have been made (LINK). We strongly urge TPR to become a member of the National Recreation and Park Association (NRPA) so that the Director and staff can stay up-to-date on the latest news and trends while also taking advantage of the discounts, benefits, and knowledge center. While a total reorganization of all Rec Districts may make economic sense, the last year has taught us that the bayou communities do not seem to support such a plan. Consequently, our focus will be on the more densely populated (North Terrebonne) districts to try and create balance and synergy. We would support the merging of Rec Districts 1, 2-3, 8 and 9. This constituency represents the most densely populated portions of Terrebonne. Over half of the households in Terrebonne fall within these 4 districts. The existing millages should be leveled off to the same figure while maintaining the current revenue numbers. It appears that to achieve the current level of property tax revenue, a flat millage of 7.0 mills would be able to take care of Rec 1, 2-3, 8, and 9. That's all of North Terrebonne with the exception of a portion of Rec 11. This would mean Recs 8 and 9 would see tax decreases (2 mills in Rec 8 and 8 mills in Rec 9). Rec 1 would stay exactly the same at 7 mills. Rec 2-3 would increase from 5 mills to 7 mills. Nobody likes to think about additional taxes. But this structure would ensure that all tax payers would pay a fair and balanced millage rate. And under our current system, Rec 2-3 may soon be asking for a tax increase anyway. This would ensure that we get tax reform first...not simply higher tax taxes and no reform. Shrinking the size of our local government could also result in cost savings for Terrebonne. A new district would only require 1 Executive Director, 1 audit, 1 accountant, etc. As an example, Rec Districts 1, 2-3, and 9 pay their 3 Executive Directors more than $170,000 combined. Having 1 Director covering the same territory could result in ~$100,000 annually for capital improvements. Additional savings would occur for professional fees (legal, bookkeeping, and paying for 1 audit instead of 4-5). This achieves a smaller government, less bureaucracy, and more efficient use of tax dollars to provide more for our community. Cost savings could be directed to help fund capital projects. Government must shrink and become balanced BEFORE the people are asked for more of their money. 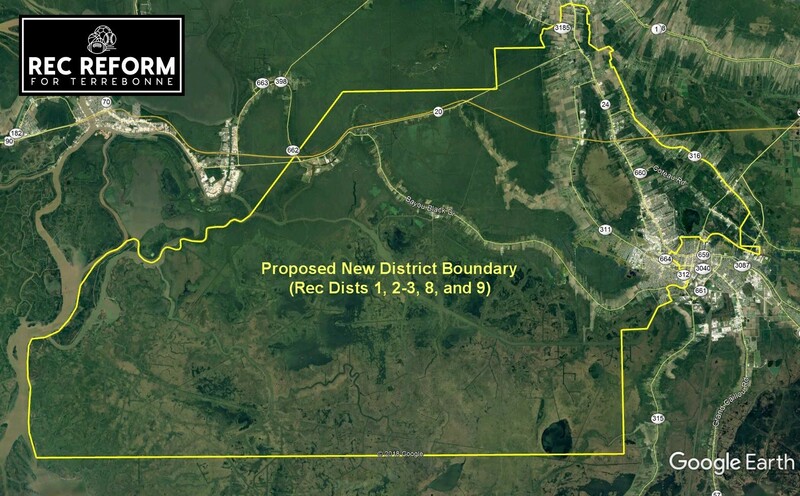 This images shows the boundaries of a merged North Terrebonne Rec District. Despite being large geographically, approximately 90% of the households live within a 10-mile circle. It is the same constituency utilizing the same facilities. 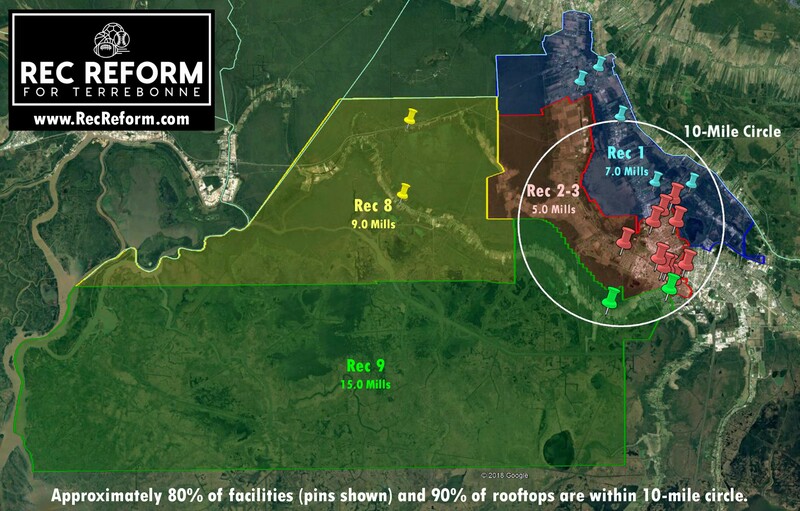 This shows that 80% of the facilities and about 90% of the rooftops in the conceptual North Terrebonne Rec District are within a 10-mile circle. We all cross these imaginary district lines to uses gyms, parks, and playgrounds. If we utilize the same facilities, shouldn't we all be paying the same rate? 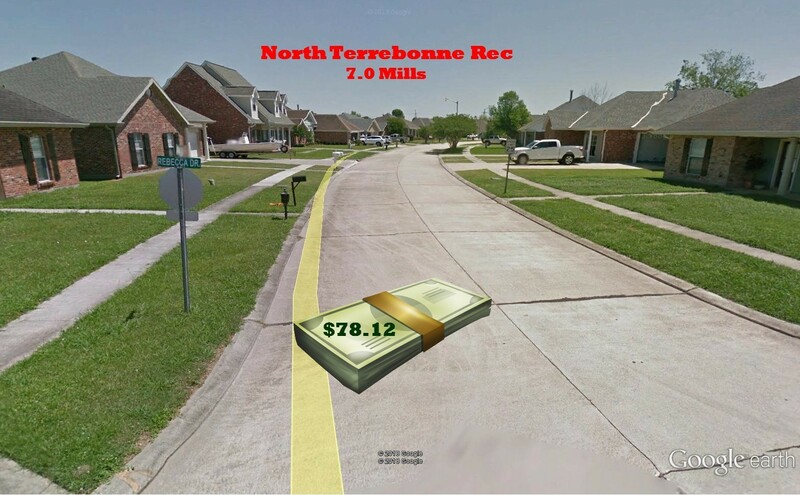 This chart shows the current unbalanced millage rates in the North Terrebonne area. This constituency shares the same facilities, so this is unjust. 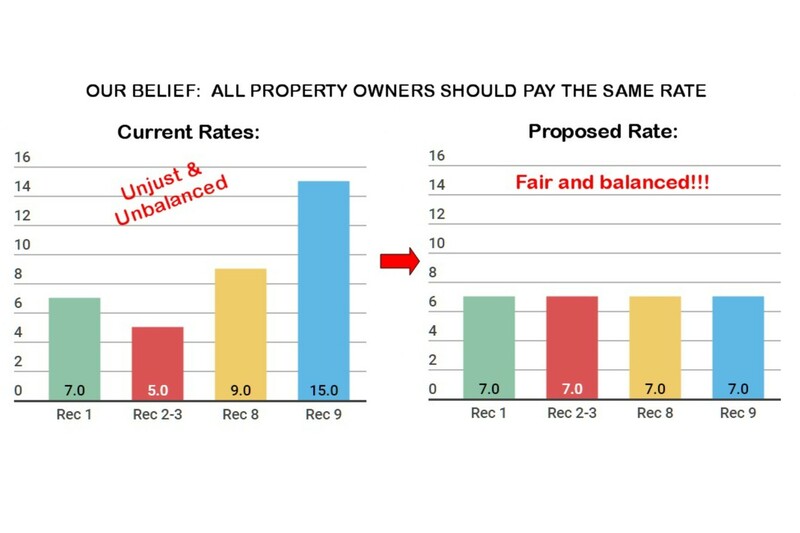 In order to generate the same amount of property tax revenue as 2018, a fair and balanced rate of 7.0 mills would be needed. The 4 North Terrebonne Districts collected $3.523 million in property tax revenue in 2018. The balanced millage rate of 7.0 mills would be revenue neutral and bring in the same amount. But now, every home and business within this new district will be paying the same, equal rate. This image shows a street in Summerfield where the Rec 2-3 & Rec 9 border runs. 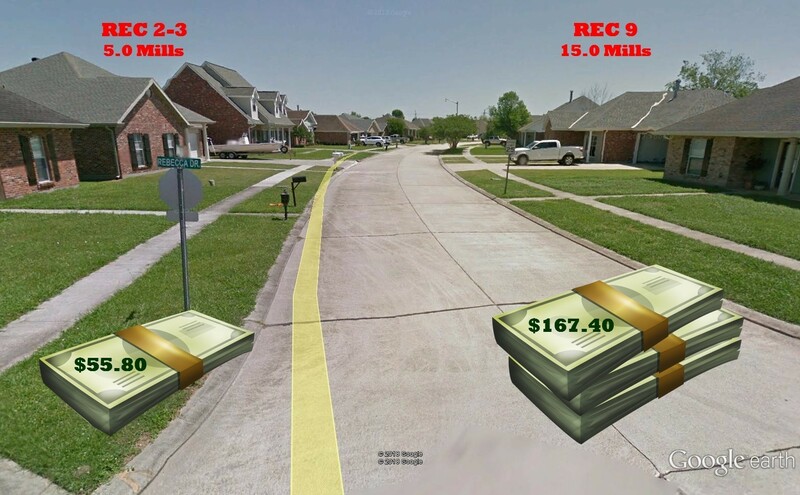 A house on the left in Rec 2-3 pays 1/3 of the recreational taxes as the same valued house on the right in Rec 9. YET BOTH OF THESE FAMILIES GO USE THE SAME FACILITIES. That just isn't fair. Should the family in Rec 9 pay $100 more per year? It doesn't have to be this way. This image shows what the houses would pay if our plan is adopted. A home valued at $249,300 would pay $78.12. If you are confused by what a changing rate would mean, this shows the exact changes for properties in various subdivisions in Rec 2-3 and Rec 9. Objectively, isn't a small sacrifice worth having a better, more efficient system for our community while also helping some of our neighbors who are paying higher taxes in the same service area? Consolidating North Terrebonne makes sense because this small service area is densely populated with more than half of the rooftops. 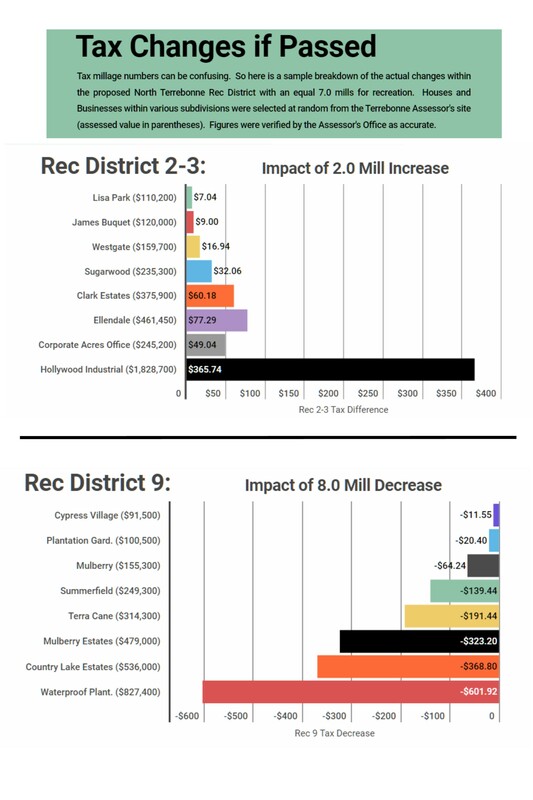 Our current "system" of 11 different Recreation Districts (to build and maintain amenities) and TPR (to offer programs) can lead to some short sighted decisions that cost taxpayers. Parish Recreation is in desperate need of a complete Master Plan. This idea has been promoted by the Houma-Terrebonne Chamber of Commerce at a recent Council Meeting (see videos in news) and appears to have the support of Parish Administration. Baton Rouge started a similar initiative in 2004 called "Imagine Your Parks". It developed a smart growth system that categorized their parks into smaller "Neighborhood Parks" and larger "Community Parks" which serviced wider areas. Each classification had suggested examples of amenities that should be featured. This would ensure that tax payer funds would be efficiently spent on building and maintaining a system for all citizens for years and years to come. We can live within our means while still providing a healthy environment for all citizens. The recent recreational reform movement began when a team from the Houma-Terrebonne Chamber of Commerce discovered that the Bayou Country Sport Park did not have a dedicated funding stream. There was no money to complete it. There was no money to operate and maintain it. Despite a recent number of much needed changes in our recreational system, a true funding mechanism for BCSP has yet to be addressed. Recreation District 2-3, the agency currently in charge of BCSP, does not have enough funds to do it on their own. If the vision of the BCSP is ever to be realized, Terrebonne Parish must provide a means of true funding. It is our belief that simply passing a new tax on top of our current dysfunctional system is fiscally irresponsible. It simply adds a new tax to a bloated bureaucracy without looking to first shrink government and cut waste. However, if some districts reorganize and work together, additional funding could be realized sooner rather than later. Then...and only then...could a legitimate discussion regarding any new taxes (if needed) be started. 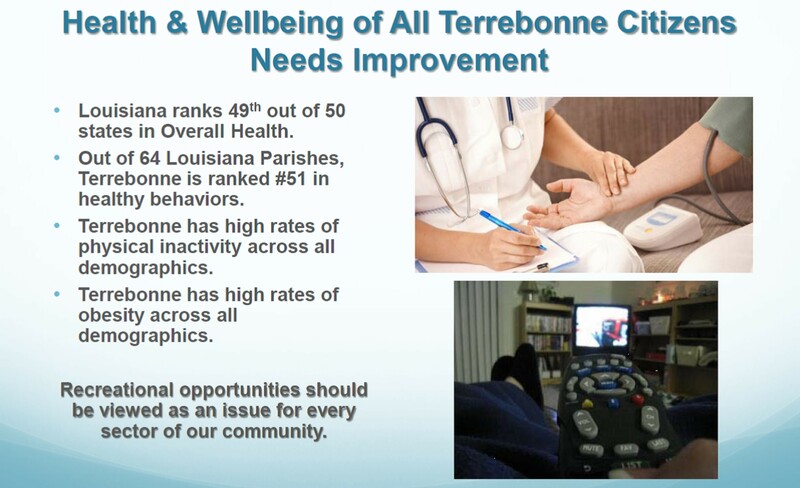 Terrebonne Parish has some of lowest rankings in key health indicators of any Parish in Louisiana. Quite simply, we must do more to recreate all of our citizens. Current district boundaries create severe inequalities with recreational tax rates. This image shows a number of locations where one neighbor pays 3 times the recreational taxes as their other neighbor. Yet, all of these people go and use the same facilities. It is our strong desire to level the tax rate for all. Balance needs to be achieved.